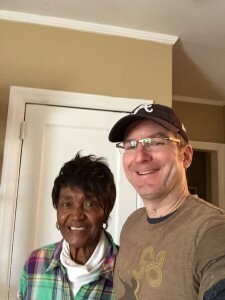 DECATUR, GA – DoubleDome team members and the companies co-founder Jim Clanin are helping needy senior homeowners in Decatur by providing them with home maintenance and repairs through the company’s involvement in Decatur’s MLK Jr. Service Project, a local non-profit. “I’ve been involved in various capacities with the MLK Jr. Service Project for about ten years now,” Clanin said. “It’s something I’m very proud to be a part of in our community.” In 2013, Clanin was awarded the Hometown Hero award for his involvement and work for the organization. This year, Clanin and DoubleDome team members participated in the organization’s annual service weekend held this month on January 17, 18, and 19. They were part of the ‘Tiger Team’, which is a smaller group of skilled workers doing small projects for several homes. The team fixed sinks, attic stairs, replaced exterior railings, secured windows and doors and worked on other various small tasks. In addition to volunteering time, DoubleDome Web Technologies donates web hosting services and designed the organization’s website www.mlkserviceproject.com. The MLK Jr. Service Project has provided free home maintenance and repair for Decatur’s needy senior homeowners each January since its inception in 2003. In January 2013, approximately 1,100 volunteers contributed over 7,000 hours of time helping 38 senior households during the 3-day weekend project. The group helps seniors to live more comfortably, safely and affordably in their homes by providing home repairs and yard work.